Waverley the webmaister goes a sail doon the watter at the fair! The last sea-going Paddle Steamer in the world ..... sail back in time on one of the world's greatest historic ships - magnificently restored with her towering funnels, timber decks, gleaming varnish and brass. See and hear the mighty engine, smell the sweet steam and oil as you sail amidst the famous scenery of the Firth of Clyde. Dine or relax with a drink in the warmth of the beautifully restored saloon, 'Clyde built' for over 900 passengers and owned by a Scottish charity. 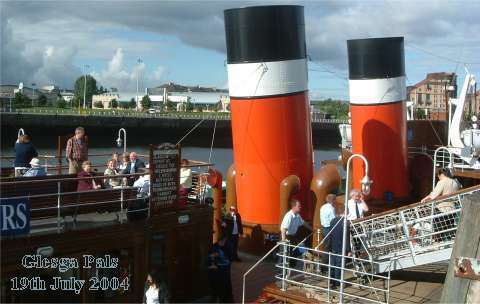 2nd Oct. 1947 the paddle steamer Waverley was launched from A & J Inglis's yard on the Clyde. She was in danger of de-commissioning in the early 1970's, but in 1974 she was bought by enthusiasts from the Paddle Steamer Preservation Society for the bargain price of one pound from owners CalMac and she underwent a major rebuild in 2000.
the Waverley first sailed from here on the 22nd May 1975. Glasgow Fair Monday, 19th July 2004, 9:30am was the Waverley's last sail from its famous berth at the Broomielaw and I was privileged to be on board on this historic occasion to witness the end of an era. Future sails will be from from the other side of the water at Glasgow's Pacific Quay at the Glasgow Science Centre. Sailing doon the Broomielaw.......north side (left side of photo) of the Clyde you can see the Armadillo and new hotels, south side is the Glasgow Science Centre and the new Waverley embarkation point Pacific Quay. There is a walkway bridge, Bells bridge, linking the science centre to the SECC side.... not very clear in the photograph...but the bridge is there! the sail continued down the River Clyde, passing Clydebank, Kilpatrick & Dumbarton in the north side and Bishopton, Langbank, Port Glasgow, Greenock & Gourock to the south of the river.